1. Mix balsamic vinegar with brown sugar in a saucepan over medium heat, stirring constantly until sugar has dissolved. 2. Bring to a boil, reduce heat to low, and simmer until glaze is reduced by half, about 20 minutes. Set aside. 2. In a large skillet, add butter to skillet and melt over medium heat. Then add mushrooms and onions and saute over medium/high heat for 3 minutes, stirring occasionally. Add thyme, salt, and pepper, and saute for a few more minutes or until onions are translucent and mushrooms are cooked and soft. Turn off heat and set aside. 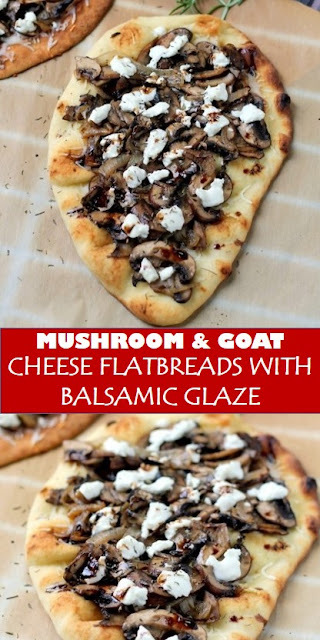 0 Response to " #recipe #food #drink #delicious #family #Mushroom & #Goat #Cheese #Flatbreads #with #Balsamic #Glaze"